This is block 18, and its claim to fame is that is has the most pieces of all the blocks in the book. 229 pieces in a 6" block. Yes - you read that correctly, 229! This was a tough one - not really hard so much as tedious. And there are so many seams that I had to pin the block to my ironing board to get it to sit flat to photograph. I'm so pleased this one is checked off my list. There's really only one more tough one to tackle ... and that's for another day! Just minutes ago I put the final stitches in the binding of my Turning Four-T quilt. I am just in love with this quilt! I think it's my new all-time favourite. 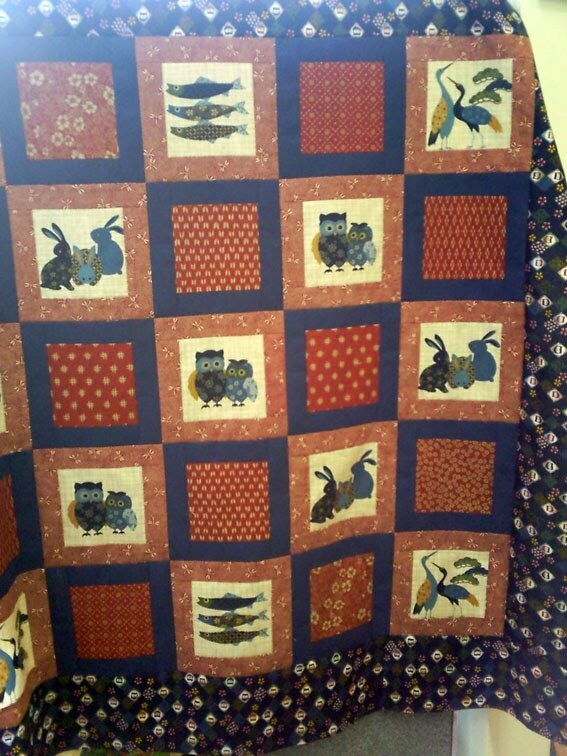 I know the picture I'm sharing is not great (and that's largely because I'm not a good photographer) but also because I wanted you to be able to see the effect of the quilting with the natural light running across the quilt. The binding I selected was a navy stripe fabric from my stash - it's a Jo Morton print. And though it doesn't appear anywhere else in the quilt, it looks really wonderful curving around the edge. Oops! It seems I must have indulged in a little 'clickage'. Twenty five yards and a jelly roll of clickage!! I can't imagine how these things happen?!? Can you believe it? Lizzy has quilted my top already, and I have it in my hot little hands. She has made a wonderful job of the Baptist Fans I requested, and her suggested thread was simply perfect. Thank you so much Lizzy! I hope to have the binding cut and machine sewn in place tonight. Then I can hand sew the reverse side down at my leisure. I think I will use one of the blue fabrics - I had thought I'd maybe use the blue-green, but I don't have any of that left. Amazing how these quilts can dictate how they want to proceed. Whew! My Turning Four-T top is entirely finished, and I just love it! Last night at 11.30pm I had put three of the borders on and was just too tired to stitch any longer. Any other day there is no way I could walk away so near to being finished. And here is a close up of a few blocks and the backing fabric I chose. At first I was thinking I may not use it, but the more I see it, the more I like it. I've just come home from Lizzy's, she's going to machine quilt the top for me. Lizzy always does a wonderful job, so I can't wait to see it when it's finished. And the wonderful news is that I can now get back to working on other projects, and even make a Nearly Insane block or two if I choose! Here are all the blocks laid out ready to stitch together - a job I'm going to start tackling this evening. I also purchased backing fabric today, but I'm actually not convinced that I'm going to use it. I really like the print (it's a taupe with a white 1/4" spot), but I'm just not sure if it's right for this project. I'll share a picture with my next post. I do have a backing on the way over from Whittles fabrics, if it's here in time it will be just perfect, but it's all about timing right now. For the first time ever, I'm having this project professionally machine quilted. My dear friend Lizzie is doing it. I have known Lizzie for such a long time, and she is just a darling. She also has a blog, and I have been meaning to provide a link to it forever. Be sure to go and visit with her, she has some beautiful quilts pictured there, along with happy snaps of her gorgeous family. Apologies for the very poor quality picture. I took this with my phone at the shop, and the window was directly behind the quilt. But you can see what I've been working on in stolen moments at the quilt store. Isn't it cute? :-) I really love the indigo fabrics that are around at the moment, and I was excited to have a play with some. The pictures and red squares were from a panel. I had planned to slap a border on the panel and call it done, but then I realised that some of the little critters were upside down. So, I cut it all up and put it back together after sashing each square, and I really like it. At home I'm still working away at my Turning Four-T blocks, and hope to have them all finished within the next couple of days. Once it's at the machine quilter, I will be able to get back to my NI quilt, and also get moving on the Kaffe Fassett project that Linda gave me. I'm soooo looking forward to that one. In the picture are six of the blocks I made this week. I'm going to try and cut some more out tonight before I head to bed. I just love the fabrics. The two conversational prints I picked up while in Kentucky. Very appropriate to have the horses as a tribute to our visit to that state don't you think?